Joel Posner releases Restore – A new Christian worship album proclaiming God's restoration life that is offered to all. As a New York native, transplanted to Southern California, Joel is a lead guitarist for Restoration Life Christian Church located in Lawndale, CA. His worship style is unique, in the past playing among secular and non-secular bands previously in New York. Recently participating on the Today Show, his inspiration is led by a love of Jesus and the indwelling of the Holy Spirit. As a songwriter and affiliate of the ASCAP, Joel's music has been influenced by a wide variety of musical genres. 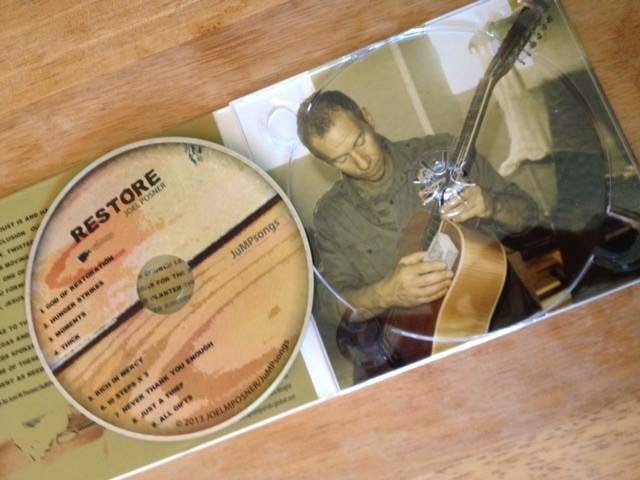 This first solo release, Restore, first released on October 1st, 2013 is available online through outlets such as CDBaby, iTunes, Amazon and other online music stores. Joel states, "Without God life just is and has no real meaning, purpose, logical direction or conclusion. Our walk with God and the Lord Jesus can at times be a rocky, twisted and sometimes doubling back course. Ultimately I am moving forward and hopefully you are too. I hope that at least one of my songs will be a blessing to you and will help to propel you forward on your journey and walk with or towards God." ~ God wants to restore you to New Life! Experience RESTORE by Joel Posner at Amazon, at CD Baby, ITunes and other online music outlets. Be sure to visit Joel at Facebook.